I’ve been snowed in for the past few days. It’s no joke here in Charlotte. We got about 5-8 inches of snow, which caused the city to literally shut down! I’ve found my self being fairly productive around my home, but after 2 days of lock down I started feeling cabin fever. I put my winter gear on and set out for a walk where I met my close friend halfway for a walk. Ahhh! It felt so good to get out! Ironically, while walking the sun finally came out and everything started to feel alive again. The smell of the air was crisp from all of the fires burning in the fireplaces around the neighborhood. My friend and I trekked through the not so soft snow and headed to the neighborhood Harris Teeter where we bought wine, chocolate, veggies, bread and more essentials. Along the way we stopped and took some photos of us doing yoga a.k.a snowga. 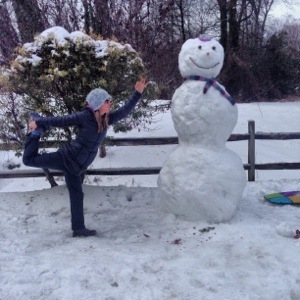 Here are a few pictures of me doing snowga.